Philips' image from the DP75 brochure, when it was launched during Photokina 1966 in Cologne, Germany. ''Following the DP70 the DP75 projector was a travesty''. 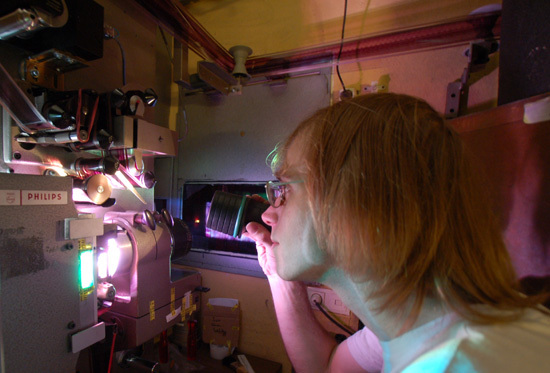 This sentiment has been widely held by many in the past and is maybe understandable given the striking difference in appearance of the two machines, it is however a view made perhaps without fully appreciating the design process and engineering that makes a projector mechanism and why economic considerations are taken into account when producing what is essentially a specialised piece of equipment. When a term such as 'specialised' is used to describe a piece of equipment the cost of production becomes important if looking to produce that item in numbers. The use of alternative materials and simplifying of a design is the ongoing story of the industrial revolution and it takes a company with vision to successfully achieve both - Philips was that company. The Dutch electronics company Philips was in the 1950s made up of various manufacturing disciplines not all in the field of electronics - for it should be remembered that until the latter part of the 20th century most electronic devices required probably as many mechanical parts as electronic components and where therefore electro-mechanical devices. 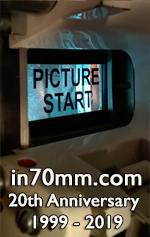 The history of the development of the World famous Philips DP70 projector is well documented elsewhere on this website but with the foregoing statement it should be of no surprise that a design as radical as the DP75 could also have been produced by the same company. Whilst the DP70 is undisputedly the Rolls Royce of projectors, a masterpiece of projection engineering, the design of the DP75 is probably more in line with the radical spirit and philosophy of the Philips company generally, but this is not to say it is better than its predecessor, only a development there upon. Placing its development in a broader context it is reasonable to imagine that given the philosophy of the Philips company and its interest in the development of cinema technology at that time, it for-saw a day when reduced labour and costs in the projection room would be the norm and designed its equipment with that future very much mind. Whilst their short lived experiment in the use of pulse-lamps did not significantly change cinema, the concept of using discharge lamps (Xenons), transistorised modular amplifiers, platters (cake-stands) and automation (Cinemation?) most certainly did, many of these ideas Philips where the first to seriously exploit. Undoubtedly the DP75 is a direct descendant of the Philips FP20 projector first designed in 1955 further developing ideas started with this model to make it dual gauge and mechanically more compact. The FP20 was the first of the Philips designs to seriously look to reduce mass and weight in its construction by using a fabricated welded steel box cabinet and lamphouse beam so doing away with 80% of the heavy metal castings used in traditional designs. At this stage however use was still being made of individual precision units such as sprocket drives and gate components - the gate being a 35mm derivative of the gate used on the DP70 - mounted on the main body of the cabinet, units that comprised several smaller individual parts that where costly to produce. The sound head assembly whilst being opposite 'handed' on the FP20 was a more 'standardised piece of design that was later used on the DP75 with only slight re-working. Interestingly the whole of the rear gear train of the FP20 was run open within the main cabinet without continuous lubrication, use being made of a combination of OILING POINTS and self lubricating materials such as nylon to reduce wear. Whilst initially not sold in large numbers in England the FP20 was used mainly in specialist applications, 'Circlorama' 1962-65 whilst strictly speaking a 'roadshow' presentation used 15 X FP20s owing to their relatively compact size, suitability to accommodate Xenon lamps and ability to be easily adapted to run synchronised to one another. Philips' DP75 advert, October 1966. 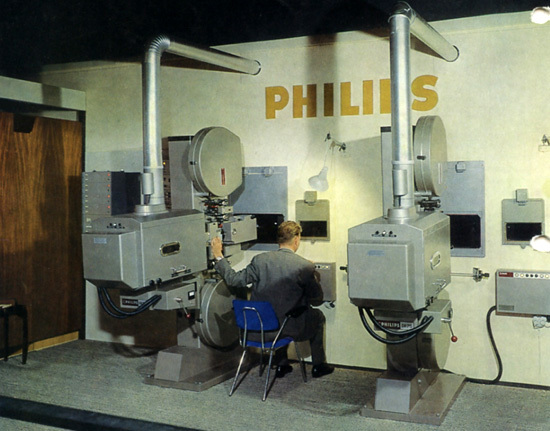 By the early 1960s the Philips company where no-doubt aware that 70mm was still the best card that cinema had to play when competing with other forms of entertainment specifically television, and that Hollywood still intended to invest in 70mm production. Perhaps as importantly the emergence of the Italian Cinemeccanica Victoria X dual 35/70mm projector in the late 1950s meant Philips now had a rival to their flagship machine the DP70. 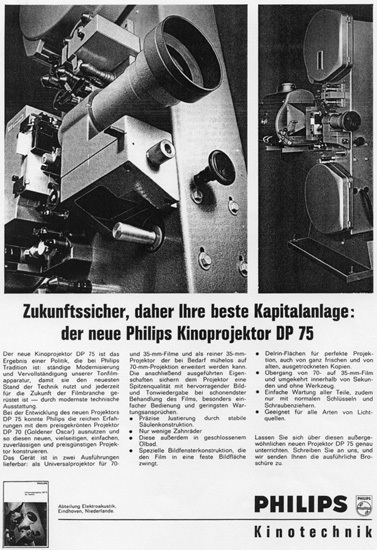 Having by this time proven that a 35mm projector could be successfully designed along simpler lines and no doubt conscious of how costly the DP70 was to produce, Philips management may have felt that if a dual gauge machine could be produced for similar cost to a conventional machine (and less than its Cinemeccanica rival) then cinema chains around the world maybe interested in purchasing such a machine. Presented as a 'cost-effective' solution to re-equipping it could be marketed on the basis that 4 track stereo and 70mm big screen films could now become available to a wider 'out-of town' audience and away from the major city centre theatres, and being constructed to the new 'compact' design would it was hoped lead to streamlining of future maintenance and reduce costs in the long term. The DP70 is a machine engineered in the traditional manner, so for the same design team to undertake design of a machine as radical as the DP75 would be to ask a world class classical composer to write a best selling album for Iron Maiden! In the DP75 then far from being a design to criticise let the observer acknowledge the clear open minded thinking (today's blue sky thinking) that must have backed the teams ability to fulfil its design brief, knowing what could be re-worked, reshaped and generally pared down, free thinking that was probably unmatched by any contemporary at the time. 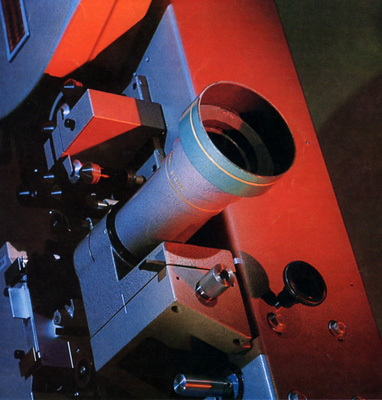 In describing in more detail the design of this projector I impress upon the reader that the same skill and engineering genius that made the DP70 projector what it was, was at work in the simplicity of design of the DP75, for it is not crude but engineered with an elegant simplicity. The genius of the resultant design lay in the fact that the whole of the mechanism that formed the film path was re-assessed for what it did and more importantly how it did it. Where multiple parts once made up individual precision units independently attached, the whole mechanism (excepting the soundheads) became contained within one easily detachable semi-cylindrical oil filled compact main casting measuring little more than 35cm x 7cm and attached by 6 caphead screws to the main steel cabinet. The reduced though robust gear train driving the main shafts still maintained the reputation of Philips projectors for their excellent smoothness of operation. As if on a mission to reduce or remove as many machining operations during manufacture mating surfaces of components were simplified and 'O' ring oil seals used extensively throughout. Probably the piece-de-resistance was the hugely simplified method by which 'Rack' adjustment is affected, by the use of a sliding bush to change the relative position of one shaft - to which the intermittent sprocket is attached - to the other, the driven shaft of the intermittent unit. This one idea is typical of how something previously complex was radically rethought saving several machining operations in manufacture and in this particular instance, the use of multiple precision gears. The normally large solid gate block that one would have thought beyond change was ruthlessly and completely re-designed taking away much precision machining in metal to be replaced by lightweight alloys and injection moulded plastics, everything it would seem that could be pared-down but still retain its function was looked at and re-designed. Where once many metal precision parts formed guides pads and other parts of the gate assembly, use was made of ceramics and high impact plastics to achieve the same result. As with so much of the design, the cost of manufacture was in the initial R & D and tooling to make each component, the resultant component itself costing very little. 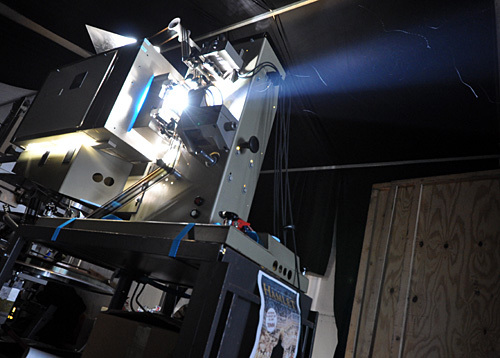 The hope of interesting a cinema chain was realised in England with the ABC chain of cinemas who backed by Associated British - Pathe' where by the mid 1960s looking to replace their existing Ross projectors. 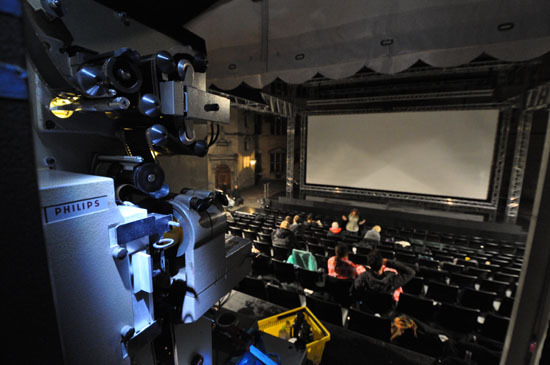 The opportunity presented by Philips with the DP75 model would be too good to miss, for here would be an chance to re-equip many ABC cinemas with new projectors with improved specification (i.e. 35mm stereo 4 track mag as standard) AND have the bonus of being ready and capable of showing 70mm films for less than Ranks where re-equipping their theatres with the dual gauge (though not fully spec'd) Cinemeccanica machines - see note 1. With new transistorised amplifier racks to be supplied by Westrex augmenting the package would give ABC cinemas a technological lead on Rank, for again the concept of using modular units would (it was believed ) mean less time lost due to break-downs and reduce time spent on service call-outs. To complete the whole cost effective package it was probably also envisaged that each theatre would change from using carbon arc lamps to Xenons - why this eventually did not happen en-mass may be that in this Philips underestimated the size of lamp that would be required to fill a 70mm screen in the large halls that then existed (3,000 or 4,000 watt Xenon lamps where not then readily available), alternatively this may have been one area where the management of ABC felt they could save money by retaining their excellent and widely used Peerless Magarcs arc lamphouses. 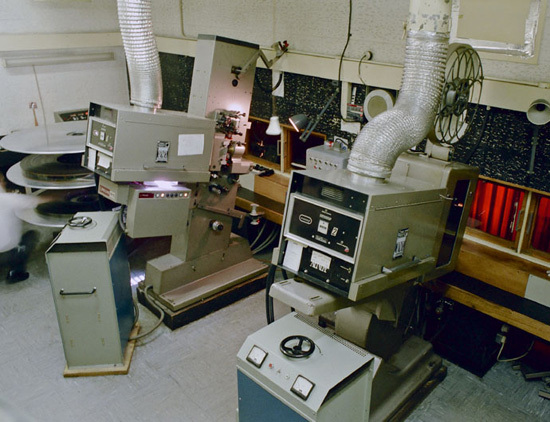 Note 1 - Whilst many Rank theatres where re-equipped with the dual gauge Cinemechanica machines, many did not have the 70mm gates, lenses or additional amplifiers required.